Thanks to everyone who was able to join us. We had a great turn out and are extremely thrilled that so many participated in supporting our mission. The board will meet soon to decide on whether to make this annual event but given this weekend’s success, it is very likely that all members will be in favor. ASSET will have an open house on November 19th, 2011 to raise money to support its on-going work in Uganda. Our mission as an organization is to provide higher education scholarships and mentorship to disadvantaged students in Uganda who demonstrate real potential for success. The needs are always greater than what our resources can cover so once again we are reaching out to members of our community for help. 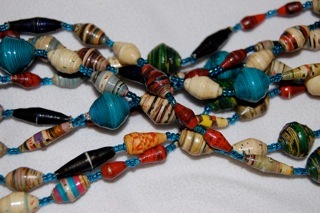 Just in time for the holidays, we will showcase a colorful collection of Ugandan handmade paper bead necklaces, with a suggested donation of $10 per strand. 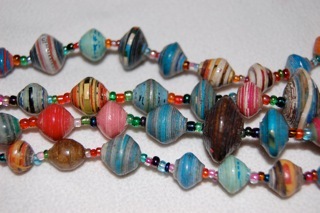 The beads are hand-rolled from recycled paper (old magazines, newsprint, fliers, etc) by women in Uganda. These fashionable necklaces are are a great idea for friends and family during the upcoming holidays. And you can feel good about choosing environmentally friendly jewelry that helps our women beadmakers earn a living-wage to overcome poverty and supports higher education of disadvantaged students in Uganda. When: Saturday, November 19, 2011 starting at 4:00 pm – 8:00 pm. Drop in anytime! You can also donate by clicking the “donate” button above to the right.